Let us first understand what serious UX really is? How it is done? And what are its benefits? 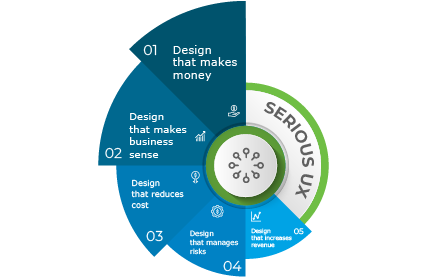 Serious UX is the UX that makes business sense, makes money for your business, increases revenue through your product design, reduces cost and/or manages risks. It creates delightful experience for your users, engages them and lets them seamlessly achieve the intended goals using your product. So, serious UX actually starts by asking the right questions about your business goals. First of all, you need to know what you want to achieve - increased revenues, conversions, engagements, reduced costs or reduced risk? Start at some point by measuring current metrics and then set business goals. Then it tries to achieve these goals by designing a great user experience. How Serious UX is done? Serious UX is a balance between achieving business goals and user goals. It is data-driven design; this data could come from various sources and can be qualitative or quantitative in nature. Qualitative data includes your business goals, users’ goals, needs, aspirations, expectations, motivations and frustrations. 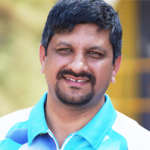 Quantitative data could be web analytics or information from your business metrics as well. 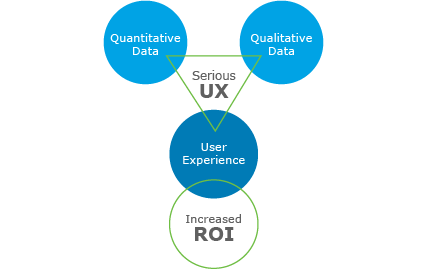 All of these data are gathered together and converted into a UX design, which ultimately achieves ROI for your business and intended experience for your products’ users. So, the focus is on understanding users through user research and then converting that into meaningful designs that drive long-term value to the users. It is not about painting screens, but it is much more than that. 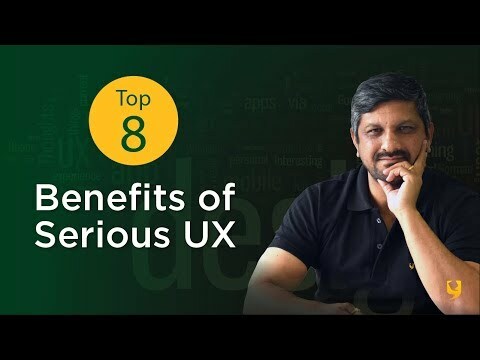 Serious UX is allowing users to engage with your product, converting users into customers as well as allowing them to complete their intended tasks with high efficiency and effectiveness. It also needs designs to be tested well during the process of product design. Once the testing is complete, your design is completely de-risked. There is a competitive advantage in working with design teams closely for implementation of the designs. "Serious UX is a balance between making business sense and making experience sense." 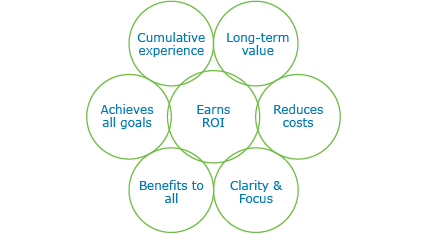 Serious UX gives a great product experience to the users, satisfies needs of the customers, help product teams to develop a great product and overall benefits the organization by increasing ROI. Serious UX acts not only when users are engaged with your product but even before and after your users get engaged with your product. It addresses all those stages of the experience lifecycle right from attraction, entry, engagement, exit and looks beyond the exit, which is a cumulative user experience. Serious UX brings about complete change or transformation to the user experience of your product, which will again bring ROI to the business. Serious UX brings clarity about the business and about the business goals to be achieved through UX design. Serious UX brings your focus to the users, their needs and expectations rather than a technological innovation or change. The entire organization then gets focused on user or customer needs and becomes oriented towards user experience in all of their actions and processes. 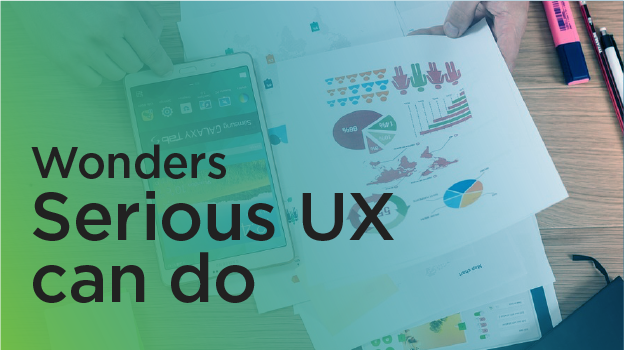 Serious UX also tries to achieve user goals, allows them not to just complete their intended tasks with your product but also brings in delight, engages them, drives them more towards your product and achieves the business goals that are already set out. Well-implemented UX provides long-term value to your users and customers and hence, they remain loyal to your brand. Well-implemented UX also reduces costs of rework, customer service and maintenance. Serious UX can do wonders for your business, but you just have to implement it in a right way. You must work with the right team/partner to implement serious UX. If you want to create memorable product experience for your users, we can come up with design strategies that create a staged experience for your users. We will deliver you the value that you truly deserve. Visit https://www.yujdesigns.com/ux-design-development/ to see our offerings.